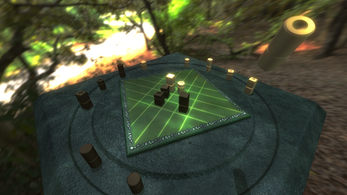 Quatter was created in celebration of the 25th anniversary of Blaise Müller's Quarto using the Urho3D game engine. There are sixteen pieces, each with four properties. Players take turns choosing a piece which the other player then places on the board. Line up four pieces - or form a two by two block - with at least one common property to win the game. As with all LucKey productions, Quatter's source code is available through GitLab.